Something that came to mind after I wrote yesterday's article. People also complain about rescues wanting fees to take thier pet in or an adoption fee if you want a pet. There is no government funding for any animal rescue, even the RSPCA relies on donations. To take in an unwanted pet costs the rescue centre. For instance a dog that comes off the street as a stray with no history will require a vet visit, vaccinations, neutering, worm and flea treatment as a minimum. This animal will also need housing and feeding while it undergoes various assessments. Once they are completed there is the advertising of that animal for rehoming as well as the ongoing care. Even animals that are owner surrendered have to have checks done, owners are not always truthful when giving up their pets. Many come with glowing reports about how they are the perfect pet but suddenly someone in the house has developed an allergy to the fur. Often this means that Rover has serious behaviour issues that have been allowed to develop to the point that the family can't cope and don't want to pay for a trainer, they'd rather pass the problem on. Or it may mean that Kitty has become pregnant and the family don't want to have the hassle of helping rear and home a number of baby cats. All of these problems cost the welfare organisation taking in that pet. An average rehoming donation is £200 this does not cover the money laid out to get the pet to the stage where they are able to be rehomed. Animals that are euthenised cost the rescue and there is no way they can get back a fraction of that money. The shelters that ask for an abandonment fee may only ask for between £50 and £100. Add that to the rehoming donation and that is a maximum of £300. So assuing a dog that is owner surrendered at a cost to the owner of £100 needs vaccinating, worm and flea treatment, neutering will cost the rescue shelter £300 after they have have had a rehoming donation of £200. This does not cover any rehabilitation and training work the dog might need, treatment of any medical conditions or any other expenses that may come with that dog. I live in Northamptonshire, we don't have any national rescue centres in this county but we do have a few small scale local rescues that look after everything from horses to hamsters. Recently many of these centres have been getting some flack, I am neither condemning nor condoning any in this blog. I am just giving my opinion in general. We did have a national rescue centre, they closed to save money, the dogs were moved to other sites around the country. Just think, if a national multi -centre rescue was having trouble, what is it like for the small guys? Some of these are run by families, some are one (wo)man bands, some have committees. All of them have limited resources. Resources does not only mean money, it includes volunteers, space, facilities, etc. Some rescues are slated because they run an appointment only system; remember they have limited resources, the people running the centre may only have themselves as staff and have animals to look after, especially on weekdays. Maybe they don't want people wandering about unescorted as the rescue is part of a larger outfit such as a boarding kennel, maybe the rescue is in someone's home, they are fostering a few animals while looking for a permanent placement. There may be other reasons they don't want people wandering around. Think about the dangerous dog act, if someone was just walking around a rescue, poked their fingers into a kennel and got bitten that dog will lose its life. Or it might be a cat or horse that injures someone this may remove that animal from the rehomable list, due to limited resources that could be a life lost. Remember the people looking after these animals know them very well, they may have animals that get stressed while people are peering through the bars like looking at a zoo exhibit. If you want to know why the rescue centre you have chosen to visit operates an appointment only system ask them. Some rescues will have a chat with you about your life style and your ability to take on specific animals in their care, they may then bring a few to meet you. This could be that they would rather you had a particular animal that is compatible to you instead of you walking around and falling in love with the looks of a pet that would not suit your home. For instance could you look after the needs of a husky when you are at work all day or would a greyhound be a better fit? Would an older pet be better than a younger one? I know of at least one national rescue that doesn't even put up photos of their charges in order to reduce that problem. All the animals in a rescue centre will have some heart rending story to tell, all will be damaged in some way. Granny dies and no one wants to take on her pet, that animal has lost everything and has been placed in to what amounts as a prison cell. The dog warden may have found a dumped dog, it could have been abused before it was cast out with the bins, a TV programme the other night showed just that scenario. Our local rescues often open the gates in the morning to find a parcel on the door. That parcel will probably contain an abandoned animal. How much better would it be for them to open the parcel to find some needs have been met? A bag of food, blankets, a gift for the humans, a volunteer? The photo at the top of this article was taken by me at a national centre a few years ago, this centre does allow people to walk around, after you have been greeted at reception and given your details, you are also generally escorted. On this day I wasn't escorted as it was an open day. Look closely at that dog, does he look happy to have someone peering though the bars of his kennel or does he look stressed? Is he happy and wagging his tail or is he turning his head away? What else can you see, can you see the dog that is hiding in the indoor area just peering though? Is this a happy dog or a worried one? Rehoming a pet from a rescue is choosing a member of your family, if you are not comfortable with that rescue, do not feel you have to take one of their animals "to get it out of there" in the same way as if you were buying a dog or cat from a breeder. Don't take an animal because you feel sorry for it, it could be a decision you regret, and because you felt you had to rescue from the rescuers what are you going to do with an animal that was taken in the heat of the moment. Or course that is if the rescue lets you turn up and take away an animal. Some do, but some want you to be fully prepared, and they want to be fully prepared. You may have to have a home visit, they may ask you to make some changes, is the garden fenced enough or could your new pet get out and straight under the X4 to Peterborough. Some will not allow you to have one of their animals if you have children under a certain age, remember the pets have baggage. Some rescues sign the pet over to you completely as they don't want the responsibility, if down the line the animal causes damage to person or property, if the rescue is the registered keeper they will have to answer for the behaviour of that animal even if you've looked after it for the past 10 years. Some rescues want to regain control of the animal to safeguard the future, if for some reason you are not in a position to keep the animal the legal owner is the rescue and that is where it should be returned or you can be accused of theft. Rather than moan about what rescues are doing why not find out if you can make life easier for the animals and staff. If conditions are really bad (I have seen horses that have not had their stables cleaned out for months, animals with no clean water etc), animals are suffering and dying then help or if this is refused, contact the appropriate people. A local breeder was raided and lost the dogs because the conditions were so bad, dogs were found dead in the kennel block, so not just rescues get overwhelmed at times. Don't forget that many of our local rescue people will suffer from the stress of managing the centres, not just the day to day stuff, but also the bigger stuff that comes with it. Being on their own they have no one to let off steam to maybe you could be that listening ear. So that is some of my thoughts on rescues. I have helped out and supported local rescues. My latest family member was a gift from her breeder but other than that I have had second hand dogs. With the weather heating up for the summer there is always the danger of your dog overheating. Dogs with heavy coats or dark hair can be especially susceptible. Everyone knows about not leaving a dog in a car, even for a couple of minutes; but what about the rest of the day? There are fantasic cool coats that you can buy for your dog; just soak in cold water and put on your dog, great when you are out and about. 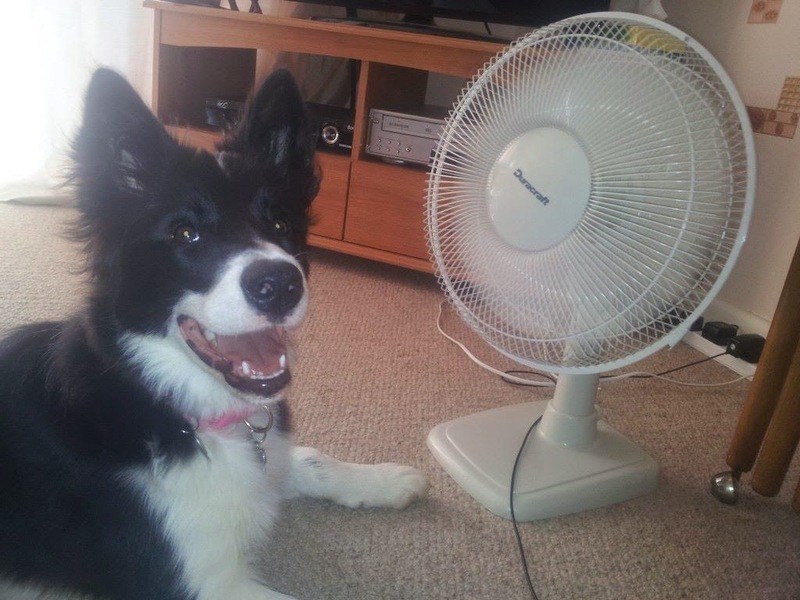 At home you can have a paddling pool in the garden, but if you don't want that mess and water dragging through the house, open as many doors and windows as possible, put on a fan and enjoy the cool air with your dog. Some dogs love to crunch on ice cubes or have a lactose free ice cream. Keep fresh water always available. If you are going for a walk, choose the cooler parts of the day, early morning or late evening are good for dogs and people. If you are going out in the heat of the day, be prepared. Try to go somewhere that you know has water your dog can swim or paddle in and take water and towels with you. If your dog is overheating you can offer a drink and you can soak the towels to put over your dog. To quickly cool your dog you can pour cool water on to the inside of the thighs, there are large blood vessels there that are close to the skin. In an emergancy you will need to get your dog to a vet as quickly as possible, keep an eye on the colour of the mucus membranes in your dog's mouth and eyes. Be vigialant, even on car journeys, if you don't have air con in your car check your dog often, it only takes 20 minutes for your dog to become seriously ill from the heat. If you want to go out but think it's too hot for your dog ask about day care or home visiting.